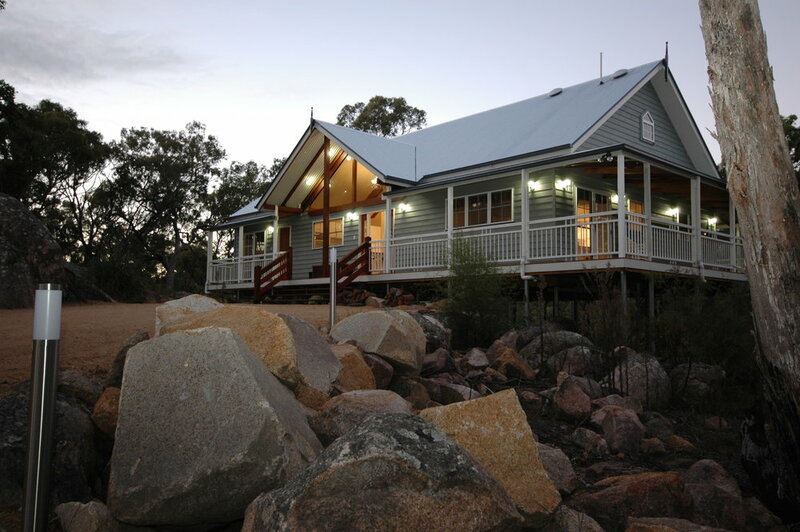 Unlike anything on the Granite Belt, ‘The Lodge’ is a treasured jewel of Diamondvale. Upon entering the Lodge, it’s jaw-dropping vaulted ceiling with exposed timber beams, reiterate the magnificence of this building ...... you will definitely feel spoilt calling this place home during your stay. Boasting a huge combined living, dining and entertaing kitchen space, a central fireplace as the main feature, and Chesterfield lounges for everyone to kick back and let loose as the conversations naturally start to flow. The Lodge features four bedrooms, two with ensuites, whilst the other two bedrooms share a large family-sized bathroom with freestanding bathtub. It was purposely built for a large family / friends getaway, or a corporate retreat, to enjoy being together, yet spacious enough for one’s privacy. Located on the opposite side of the creek and only a couple of minutes walk from the cottages for ultimate seclusion. Built over enormous Granite boulders, the Lodge has wrap around verandahs accessible from each bedroom, and a large BBQ deck, floating in the tree canopy, the Lodge is perfectly positioned to soak up the views and feel like you are millions of miles away from civilisation! Diamondvale Lodge is filled with all the amenities (just like at home) so that, should you wish to cook, you need only bring your clothes and fresh food!